Looking for an incredible comfort food for dinner tonight? We’ve got you covered with a gnocchi pasta with Prosciutto di Parma and sun-dried tomatoes. This dish is the perfect combination of flavors with a crisp white wine, savory (and sweet!) Prosciutto di Parma and earthy mushrooms, which makes it a soon-to-be favorite with everyone. 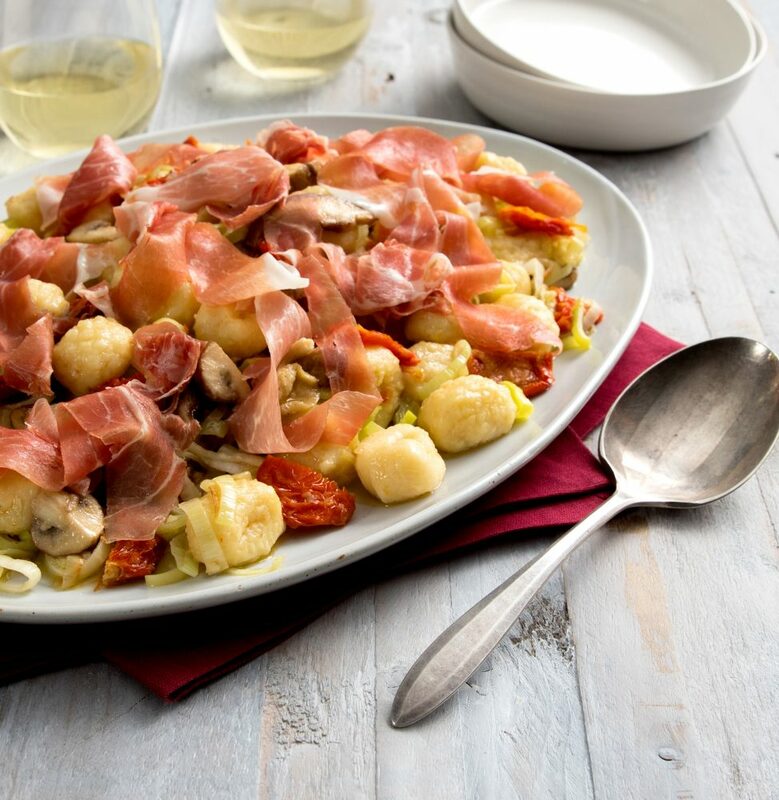 This gnocchi pasta with Prosciutto di Parma is hearty enough to stand on its own as a main course. Pair with a milder beer to balance the slightly heavy gnocchi, or class things up a bit by serving with your favorite bottle of Italian white wine. Heat olive oil in a large skillet over medium-high heat. Add leeks and garlic, and cook, stirring frequently, about 3 minutes until leeks are softened. Add mushrooms, sauté until cooked through, about 4 minutes. Add white wine; stir until wine is almost completely evaporated. Add tomatoes, broth, salt and pepper. When broth is cooked down by half, add butter and cooked gnocchi. Stir to coat gnocchi. Add cheese and prosciutto; stir. Serve in a bowl topped with additional cheese and prosciutto, if desired.